Sadie: Hey! I'm Sadie Jewel! Tre: *pushes Billie out of the shot* I'm Tre Cool. Sadie: I'm so excited to be on GSB and so are the boys. Sadie: Oh yeah, this is St. Jimmy, my mustang stallion. He is the best. Sadie: Tre. Please don't start this right now. Sadie: Well, that was...awkward. Anyhow, I hope to make a lot of friends here on GSB. Thanx for your time. Just a preview of what I like to write for my Fanfiction stories! Hope you likes! I take requests for drawings. Just comment and tell me what you want. I love doing art for people. 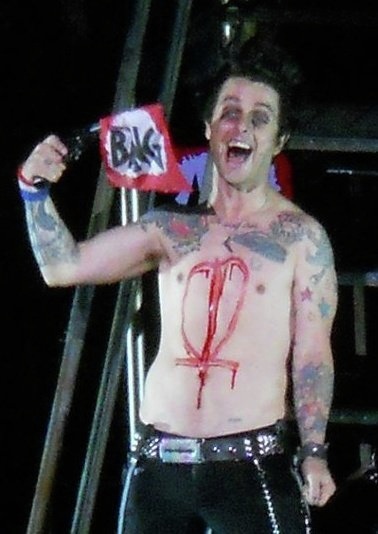 I actually know Billie Joe's wife. She is super nice. awww omg your soo lucky!!! and its a photo website?? it actually sounds pretty cool. ill have to check that out..
omg how did you even meet her!!!??? you are so lucky, you get to talk to them!!! and what is flickr.com??? Hi! Soo whats up? I like your new username! Its cool! wow you seriously know billies wife?? And I'm all wright, just celebrating the one-year anniversary of the release of 21CB. thats totally messsed up!!! like wouldnt she be there to like supervise?? Location: chasing ducks in Central Park. Location: City of the Damned!! !